Stanney Oaks, near the Ellesmere Port and the city of Chester, is perfectly located with a wide variety of amenities such as the renowned shopping outlet Cheshire Oaks, Leisure Centre, Museum, Aquarum and the world famous Chester Zoo. Of course, there’s also up to three primary schools and three high schools, a nearby golf club, local shops & great local pubs. It’s the outlet though that makes Stanney Oaks such a desireable place to live with brands such Ralph Lauren and Barbour, as well as a diverse selection restaurants with a varying cuisine to keep all the family happy. If you think it’s all about retail therapy, think again. 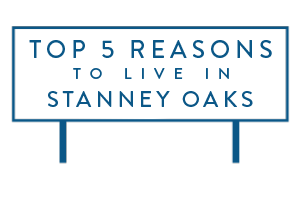 Stanney Oaks is surrounded by beautiful walks through the lacal Nature Reserve and woods. With quick access to the M53 and M56 motorways and local train stations, it is an ideal place to commute into Liverpool, Chester or Manchester. If it’s a traditional twon feel you are looking for and a sense of history, it’s only a short drive to Chester City Centre and near the North Wales border, making Stanney Oaks perfect for families and couple of all ages.